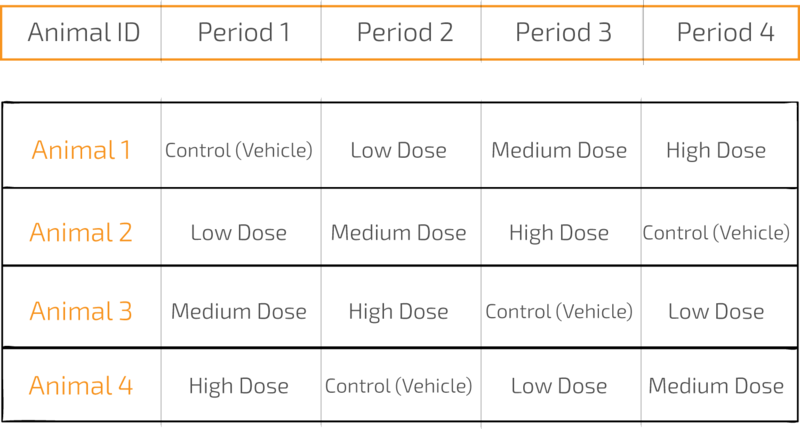 The standard study design for safety pharmacology studies is the Latin-square cross-over design, which is widely accepted as conferring the best statistical power (sensitivity to detect changes in cardiovascular parameters of interest). Dosing is performed by the required route following a Latin Square sequence, with an appropriate recovery period between treatments based on known PK/PD profiles. Data are recorded both immediately prior to and following each exposure for a time interval appropriate to capture potential pharmacodynamic effects of the parent compound and metabolites, as applicable. Would you like to know more about cardiovascular safety pharmacology studies? If so, please check our services.